Olivia and I made it through the first day on our own without any major issues. We napped and ate our way through the day. And this granola happened. Maybe that is why the day went so well. An afternoon snack of granola with a double dose of chocolate has to make the day a little easier. My last stash of homemade granola disappeared many weeks ago and I have been hankering for more. 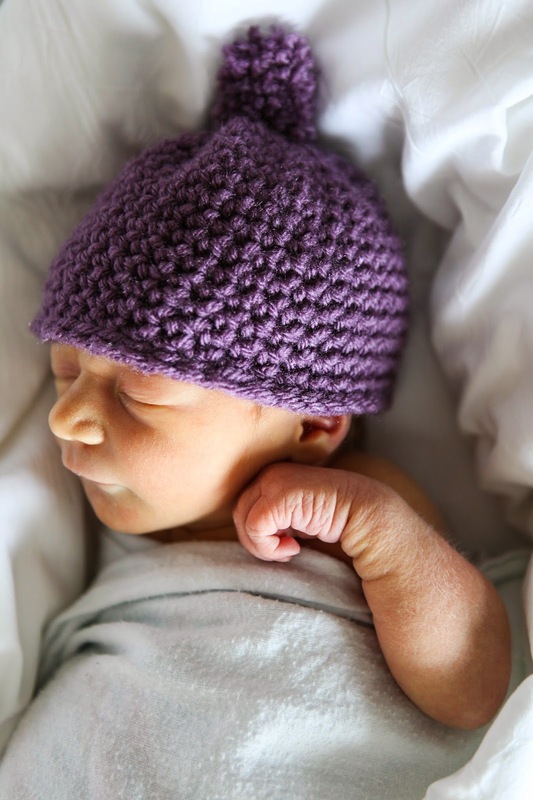 Of course with a newborn the best of plans get pushed aside or shifted frequently. Initially I was going to make this last week. I had all of the ingredients and was ready to go. Mr. J was home so I had an extra set of hands. But then cuddle time got in the way. Preheat the oven to 350 degree F. Lightly spray a large cookie sheet with cooking oil. Set aside. Pour oats, nuts, and coconut into a large bowl and set aside. In a smaller bowl, mix melted coconut oil, cocoa powder, and dark brown sugar until combined. Add maple syrup and salt and mix until combined. Pour over oats and mix until all oats are moistened. Bake for 30 minutes, stirring every 10 minutes so the mixture on the edges moves to the middle. Remove from oven and cool. Add the chocolate chips once completely cooled. Store covered at room temperature for up to three weeks. This post took me a long time to write. It started off as a one week post. Then all of a sudden we were two weeks in. And as much as I hoped to hit publish last Thursday, here it is the following Monday. Maybe the title should be Week 2 and 1/2? Time flies with a newborn. I also struggled to put into words all of the emotions and thoughts flowing through me on a daily basis. Everything people tell you about becoming a mom is more true than I ever imagined. You really don't know until it happens. 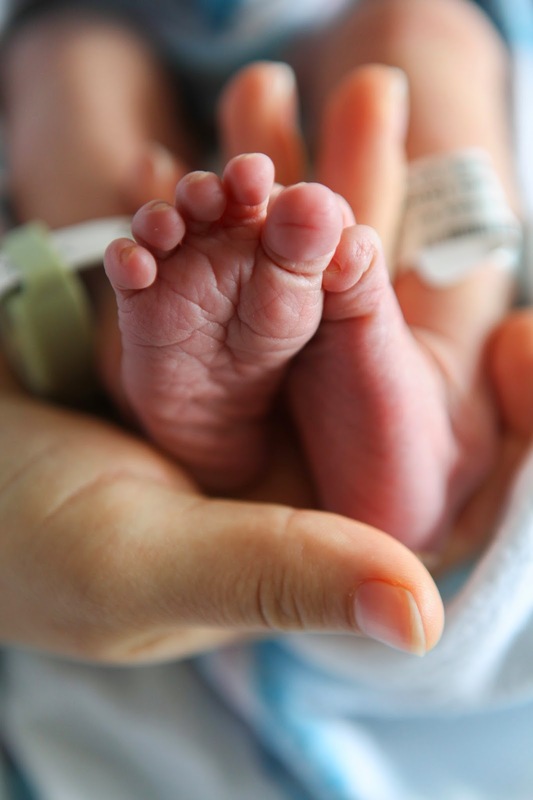 There is no preparation for the overwhelming feelings of love and protection the second you hear the first cry and/or see your baby. For me it was a smack in the face in the very first minutes and has only grown stronger with each passing day. I didn't know my heart could grow so much for my baby, my husband, and my life. I thought there were some tough times when I was pregnant. Tired, nausea, overall being uncomfortable 24/7. Labor is also difficult. My was long and horrible and I would do it all over again to bring Olivia into the world. Having a newborn is also difficult. It is a LOT of WORK. The whole pregnancy thing seems like a dream come true compared to some of the sleepless nights and tiring days we have experienced in the last two weeks. But surprisingly, here we are all still alive and very much loving each other. Our days fly by without me knowing exactly what happened. There are the feedings, the sleeping, and the changings. Those are a given. The times that stick in my mind though are the little moments. When she grabs my fingers or looks at me with her big blue eyes I couldn't imagine being anywhere else, nor do I want to be anywhere else. And oh when you see the man you love, your partner, love something you both created with as much tender care as you would have, only different in his unique way, I lose it all over again. I have had moments when I think about how things will be different; things are different. Our few outings have taken much longer to prepare for and plan out. I know we won't be able to jump on a train and spend the day in NYC at the last minute but I don't care. It is funny how so very different things are today than I ever imagined them to be. What I thought would be hard is easy and those easy things are at times horribly hard. It's amazing how all of that disappears though with a little snuggle time. This week is just me and her for the first time. I am both excited and horrified as to what may occur all at the same time. Just when I feel like we have a routine, a knowledge as to what to do, things get switched up. First it was the hospital, then it was home with Mr. J and now it is the two of us. Regardless, I know it will be wonderful and any bad things will magically be forgotten in a day, an hour or even minutes after happening. It's Wednesday and we are almost at the two week mark from little Olivia's birth date. How did that happen? Some of the days seem to last forever and then when I look back it is one big blur. Weren't we just in the hospital yesterday? It is no joke when they say the time goes by fast. For the most part we are all doing fine. Just when I think we are getting into a routine she goes and switches things up. I think she will keep us on our toes for many years to come. Meals have been pretty good. I can go longer than I ever imagined without eating but other times I have insatiable hunger. Smoothies haven't made as frequent appearance as I thought they might. As fast as smoothies are they take more time than a bowl of cereal. This day I had a second breakfast at 11 am and then lunch at 2 pm. I was so hungry I missed the photo. It was some leftover Santa Fe chicken from the slow cooker. I highly recommend this recipe. Easy and delicious. Dinner was flank steak with peppers and onions. Mr. J grilled it. It might be a bit too early to grill still as the temperatures were a bit chilly but it was so nice to get that grilled steak taste. The rest of the day is spent looking at this sweet face. What did you eat Wednesday? Join the party here. One of the biggest lifesavers for a quick, healthy, filling and delicious meal/snack is granola. Homemade granola is amazingly easy to make as long as you have all of the necessary ingredients on hand. I now make it a point to have all of the necessary ingredients on hand. 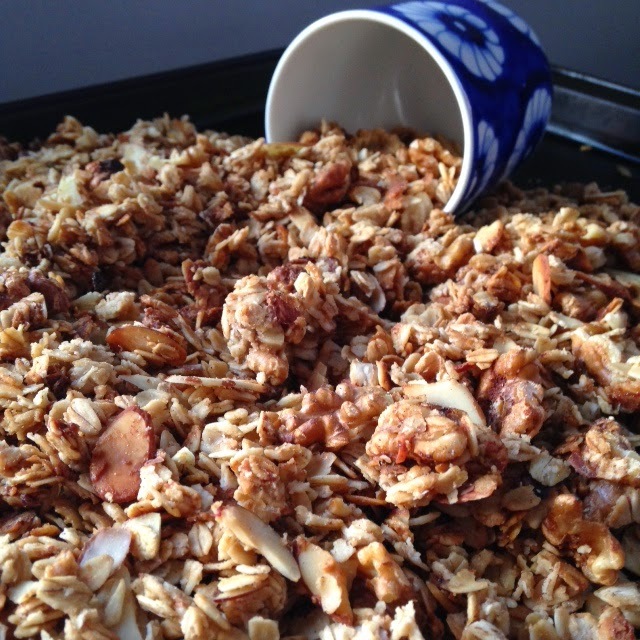 Here are a few of my favorite granola recipes. Hello beautiful! Yes, these bars are full of all sorts of chocolate and peanut butter goodness. Sleep has been lacking and I needed something sweet but also somewhat filling. These bars are delicious but also have oatmeal and peanut butter, just what this new mama needs to get through some of the late night, all night long feedings. The recipe comes together super fast and doesn't take long to bake either. I didn't wait for them to cool down before digging right in. I originally cut the bars into 16 pieces and then realized that both Mr. J and I were scarfing down two at a time. They didn't last long but because they only require pantry staples I will be making them again soon. And then again after that too. Preheat oven to 350°F. Spray an 8x8-inch baking dish with cooking spray. Set aside. In a stand mixer beat together the peanut butter, brown sugar, baking soda, and salt on medium speed until well combined. Add the egg and vanilla, then mix on medium low, just until incorporated. Remove from mixer and stir in the chocolate chips and oats by hand. Press the dough into the prepared baking pan. Bake for 20-22 minutes, until golden and the top is set. The middle may appear slightly underdone but it will continue cooking in the pan. Let cool completely in the pan. On Thursday, March 12th we met Olivia Anne for the first time. She came in at 7 lbs 6 oz and a long 21.5 inches. We are beyond thrilled and overjoyed. The past few days have been a whirlwind. I don't know where the time has gone. We are all getting used to each other and figuring out the best routine. I plan on sharing more soon but now I am off for a bit of rest. In case you didn't get enough options for muffins in the muffin round up I posted last week here is another brand spanking new one. March in Maine means maple season. Maybe no this year with all of the snow on the ground but most years. See the sap runs best when the day temperature warm up but it is still cold and crisp at night. This is Maine in March. I am lucky enough to have in-laws that make their own maple syrup. It is a ton of work to get maple syrup. I don't know the exact ratios but it takes a whole lot of sap to make one gallon of maple syrup. Yes, it is expensive in the stores but if you knew the effort it took to get to that point you would understand. Anyway these little muffins are healthy. Think whole wheat flour and oatmeal. They are sweetened with maple syrup. I made them plain but after eating this batch I realized you could easily and very deliciously add some berries of your choice to the base batter. I like my muffins plain. Thus these are a perfect no thought grab and go breakfast and snack. Of course this is not the case with Mr. J. He likes at the very least some butter or jam. He took these and grilled them for dessert, topped with ice cream and more maple syrup. Take your pick! Preheat the oven to 350 degrees F. Lightly grease a standard 12-cup muffin tin or line with paper liners and set aside. In a separate bowl, whisk together the milk, maple syrup, oil, eggs, and vanilla. Make a well in the center of the dry ingredients, then pour the wet ingredients into the center. I have to say pie is not one of my favorite desserts unless of course it is French Silk Pie. A girl has to have her chocolate right. Pie though is Mr. J's favorite dessert. Mostly apple but he loves all sorts of others too. And after doing a little digging I realized I have way more pie recipes on this little blog than I realized. Here are my top 11! One of the things I have been doing lately is making a batch of muffins Sunday afternoon. They are the perfect afternoon snack and then we have a quick grab and go breakfast or snack all week long. 12 muffins is the perfect amount to last Mr. J and I through the week. The past month I made some new muffin recipes but in doing so I realized I had a plethora of muffin recipes here on the blog. 27 to be exact. If you are numbers person that is half of the year worth of weekly muffins and then some. Pretty good if you ask me. Enjoy! There is nothing like going into a liquor store when you are about to have a baby any day. People will look at you funny. Even if you are with your husband. Even if you don't carry a thing. Along with our fudgy Irish Cream Brownies we made Irish Beef Stew for dinner as our tribute to all things Irish in honor of St. Patrick's Day. Mr. J wanted to be authentic so out we went to get some Guinness. Now I am not drinking but even if I did I would never ever want a full bottle of Guinness. Our goal was simple, find one bottle of Guinness for the stew and no more. I don't know about where you live but around Connecticut many of the liquor stores sell single bottle of beer. You can buy one or mix and match your own four or six pack. The key is finding the beer you want. Well luck was on our side because the first stop had one bottle of Guinness Original Stout waiting for us. A dinner like this takes some time and effort. Lots of chopping and time to simmer. In the end though it is completely worth the wait. The stew was full of rich taste and was enough to feed an army. We had some bread for dipping as well. Although I will never understand the infatuation with drinking Guinness, I will say those Irish know a thing or two about their beef stew. Sprinkle about a teaspoon of salt over the beef pieces. Heat the olive oil in a large (6 to 8 quart), thick-bottomed pot over medium-high heat. Pat dry the beef with paper towels and working in batches, add the beef and cook, without stirring, until nicely browned on one side, then use tongs to turn the pieces over and brown on another side. Add garlic to the pot with the beef and sauté 30 seconds or until fragrant. Add the beef stock, water, Guinness, red wine, tomato paste, sugar, thyme, Worcestershire sauce, and bay leaves. Stir to combine. Bring mixture to a simmer and then reduce heat to the lowest setting, then cover and cook at a bare simmer for 1 hour, stirring occasionally. Add the onions, carrots, and the potatoes to the beef stew. Add black pepper and salt to taste. Simmer uncovered until vegetables and beef are very tender, about 40 minutes. Before serving discard the bay leaves and tilt pan and spoon off any excess fat. Sprinkle with parsley and serve. I haven't told you about any of my books for while now. My reading dwindled a bit when I stopped flying. (There is nothing like 2 uninterrupted hours on a flight to get you through a book fast.) Also my nightly reading has dropped to about 20 minutes. Once I am in bed I don't care how interesting the book is my eyes start to droop immediately. Torch, is by the bestselling author Cheryl Strayed who also wrote Wild. You know the movie with Resse Witherspoon. Torch is her debut novel and it seems to be getting more attention now for some reason. It got on my radar after seeing it on several must reads articles and then finally ended up on my library's recommended list for the month of February. Torch is a sad novel about a family suddenly faced with tragedy and struggling to deal with unexpected loss. Amazon says: "Teresa Rae Wood...has fled a bad marriage and rebuilt a life with her children, Claire and Joshua, and their caring stepfather, Bruce. Their love for each other binds them as a family through the daily struggles of making ends meet. But when they received unexpected news that Teresa, only 38, is dying of cancer, their lives all begin to unravel and drift apart. Strayed's intimate portraits of these fully human characters in a time of crisis show the varying truths of grief, forgiveness, and the beautiful terrors of learning how to keep living." To be honest this book is sad. Not something I would recommend right before you have a baby. My bad. However it is good. It looks at three individual's grief and how they deal with it in incredibly different ways. Meals lately can be more described as snacking. All. Day. Long. I don't feel super hungry like I used, the kind of I am going to kill you if I don't get food into me this very second but I do get hungry. And it is often. I am pretty lazy at this point when it comes to putting things together so basically all day long it is mix and match of snack. This has added up to some pretty darn good options. Breakfast is still a green smoothie. I finished up the last of the banana bread granola. Contemplating whether or not to make more before or after the baby comes?!?! Also ground flax seed makes for a thicker smoothie. I was told to up my fiber right now and and adding two tablespoons to my morning smoothies is my current method. English muffin pizzas for lunch. Why yes please. So simple and so delicious. This is a classic that will never be bad in my book. Also a classic is an egg and cheese sandwich. This homemade version was way better than the one from last week which cost $4. Double the egg and topped with fresh basil. I had this at 11am. Does it make it a late breakfast or an early lunch? Another quick and easy snack I have been having lately is plain yogurt with M&M trail mix from Archer Farms. Almost dessert. I have this around 3pm to get me to dinner time. It takes all of 1 minute to put together. Funny, I got the trail mix for Mr. J to have at the hospital for a snack option. I made him swear not to eat any ahead of time being afraid it was going to be gone. Now I am the one snacking away. Here is my other attempt at spicy food. A plate full of nachos with the spiciest salsa in our pantry. Fingers crossed it helps jump start my labor. And now for the one meal we did create this week. Meatloaf, mashed potatoes, broccoli and carrots. An American classic for sure. Mr. J sure loved it and we had plenty of leftovers for tonight's dinner! That's a win in my book. What is your favorite snack? What did you eat Wednesday? I am not Irish and St. Patrick's Day has never really thrilled me. It seems like it is a time for people to drink a ton, watch parades and dye things green. I just don't understand. However, I am not opposed to making some boozed up desserts. My parents and brother all enjoy Irish Cream. Somehow a bottle ended up in my fridge. It seems fitting to crack it up in honor of St. Patrick's Day and fit it into some wonderful fudge brownies. These brownies are intense. They are incredibly rich and chocolaty. The Irish Cream not only adds the unique Irish Cream flavor but also adds moisture to the brownies making them dense and fudgy. I used an 8x8 pan and they ended up being about an 1 inch thick. I cut them into 16 squares. Mr. J could eat a whole one but I ended up cutting them in half again. If you wanted more reasonable brownies you could try a 9x13 pan. (Sometimes brownies are meant to be unreasonable!!) I also drizzled about 1 tablespoon of Irish Cream on top of the warm brownies for some extra flavor. Even if you aren't Irish these brownies should be a must in your future plans. Preheat the oven to 350. Line an 8x8 baking pan with foil or parchment paper. In a microwave-proof bowl, combine the chocolate chips and butter. Microwave in 30-second intervals until melted and thoroughly combined, stirring after each one. Set aside to cool. In a large bowl, whisk together the brown sugar, eggs, and ½ cup Irish Cream liqueur. Stir in the melted chocolate-butter mix until combined. Stir in the flour mix until just combined. Pour into the prepared pan and bake for 40-45 minutes or until cracked on top and a toothpick inserted comes out almost clean. Remove brownies from the oven. Allow to cool completely before cutting and serving.